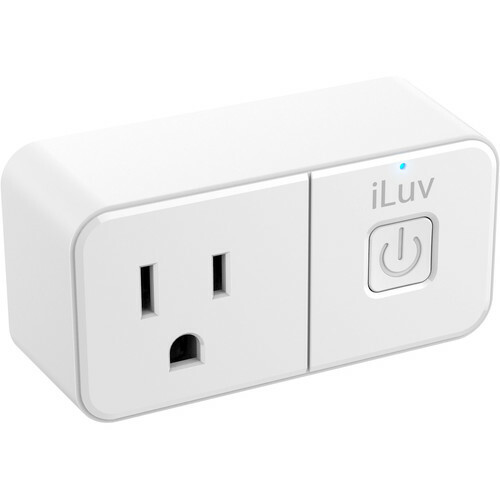 The 4-pack SMPLUGMI4UL Wi-Fi Smart Plug from iLuv allows you to control up to four devices in your home from anywhere in the world when the devices are plugged in, thanks to 2.4 GHz Wi-Fi connectivity. Control a device in your home from anywhere in the world by plugging it into the SMPLUG1ULWH Wi-Fi Smart Plug from iLuv. This smart plug enables you to turn on and off devices such as a lamp, fan, coffee machine, television, or washing machine. Scheduling and countdown timers add an additional layer of customization by enabling you to decide when you want a plugged-in device to be turned on or off. Thanks to 2.4 GHz Wi-Fi connectivity, no hub or subscription service is required for operation. This plug is compatible with Alexa, Google Assistant, and IFTTT. The free mobile app enables remote access and control via iOS and Android devices. Box Dimensions (LxWxH) 1.3 x 0.8 x 0.6"